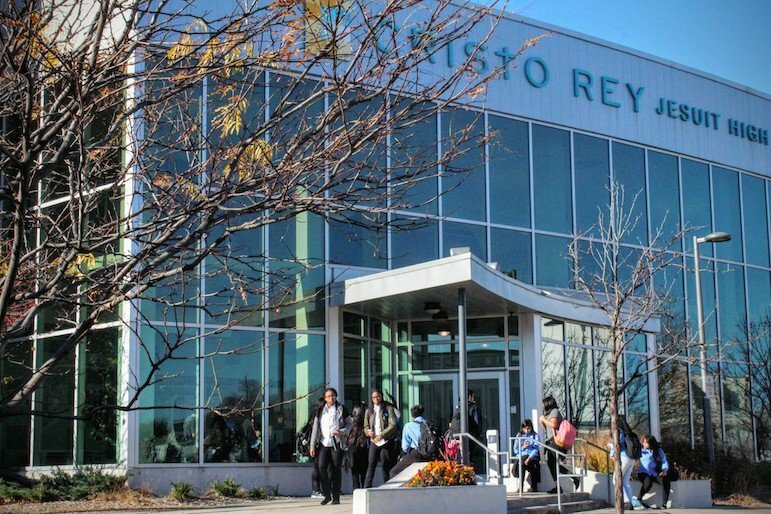 Cristo Rey Jesuit High School in South Minneapolis was one of 274 high schools that participated in a statewide mock election. Cristo Rey voted for Hillary Clinton. Photo by Cristeta Boarini. Long before most registered voters went to the polls on Nov. 8, Minnesota high schools held a mock election to determine their own outcome of this year’s presidential race. Conducted by the Secretary of State’s office, the mock election’s first round of results – released on Nov. 2, six days before Election Day – had Donald Trump winning by a margin of 2 percent among more than 77,000 Minnesota high school students. Two days after Election Day, Hillary Clinton ended up winning the mock election by 319 votes, or a slim 0.33 percentage points – within the margin eligible for an official recount. At first glance, the too-close-to-call results seem to contradict exit polling data, as young voters nationwide ages 18 to 29 voted for Clinton by a wide margin in the real election. 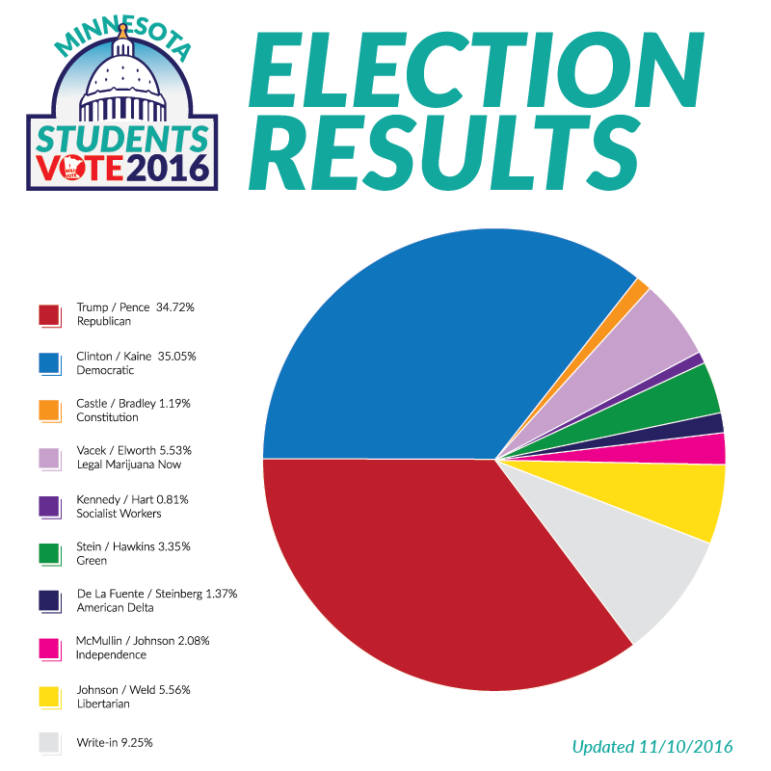 The mock election was even closer than Minnesota’s presidential election results, where Clinton won by 1.52 percentage points. However, the mock election results belie a more complex level of youth engagement within the world of politics, in not only who youth say they support but also in how they choose to participate. Graphic courtesy of the Minnesota Secretary of State. But some students have expressed wanting to learn more than just good habits and hands-on voter booth experience when it comes to civic engagement. As tensions erupt and students come face-to-face with the bigotry fanned by the Republican campaign, they don’t want to just know how to vote. They want to know how to advocate for themselves – outside the voting booth. Far from a commitment to the ballot box young people are increasingly turning to protest and direct action. They care less about candidates and more about issues and they are ready to make themselves heard on those issues. “I’m more upset that so many people agreed with him. That so many people voted for him,” said Angelica Bello, a sophomore at Southwest High School. Students across the metro echoed that sentiment and on Friday, Nov. 11, 250 South High School students organized a walkout and marched to downtown Minneapolis in protest of Trump’s election win. Despite the charged school environment, not every student felt compelled to vote or protest. For many students, the “mock” election was just that – something to be mocked. And even though they are highly engaged with the issues, there was a disconnect between what they cared about and who the people representing them on the mock ballot were. I asked Minneapolis resident and youth community health worker Kristina Sanchez-Standingcloud if she thought this type of education would make a difference. That connection between thoughts and actions is what young people say motivates them. They want people to understand what is at stake and not in a hypothetical way. Reports of attacks on POC, queer and Muslim youth in Minnesota are flooding in and the students know who the victims are, if it doesn’t happen to be themselves. A former student of mine, now a freshman at the College of St. Benedict’s in Collegeville, Lupita Rubio Robles, posted on social media about an experience she had on campus. One of her white male counterparts at St. John’s University told her she wouldn’t be there next year because “people like her don’t deserve to be in such a prestigious university as St. Ben’s.” He called her an illegal alien (Rubio Robles is an American citizen), and those kinds of remarks are more and more hurled at marginalized students, a signal of who isn’t welcome in Trump’s great America. One surprise with the mock election results is that 5.56 percent of the vote went to Libertarian Gary Johnson and 5.53 percent went to Dan Vacek of the Legalize Marijuana Now party. Both of these candidates – had this been the actual election – would have been eligible for state campaign funding based on these margins, as minor parties only need to gain 5 percent of the vote to qualify in Minnesota. Adding two more major parties to future elections would have drastically changed the face of the political landscape if the mock election reflected the real results. As we look toward the future and the next generation of voters, these students wonder if household influence will sway young voters’ opinions, and the data seems to point to yes. Eighty-seven of the schools that participated in the mock election had eighth graders and younger participating – students who are arguably more influenced by parents and guardians than their older peers. Trump won by massive margins among the younger students, garnering 50.93 percent of the vote compared to Clinton’s 26.91 percent. Truth is, at school and at home we force-feed youth the mythology about our country’s moral fiber, we tell them America is great and Americans are exceptional. Most importantly, we never discuss or acknowledge the divisive nature of our government and political systems, or the prejudice and bigotry they are based on. If this is the education our children receive, no amount of school will effectively combat Trump-like bigotry. Voting is important, there’s no doubt about that. But it is not the only way to produce change. As the country’s demographics shift and more and more folks wake up to the truth of our institutions, we can turn to more direct action and education to holding our country accountable to its ideals. And like always, the young people are leading the way. On May 25, 2016, St. Paul School Resource Officer Bill Kraus forcibly arrested then 19-year-old Darion Bell outside of St.